Ucom has come up with a new revolutionary offer for its fixed services subscribers. 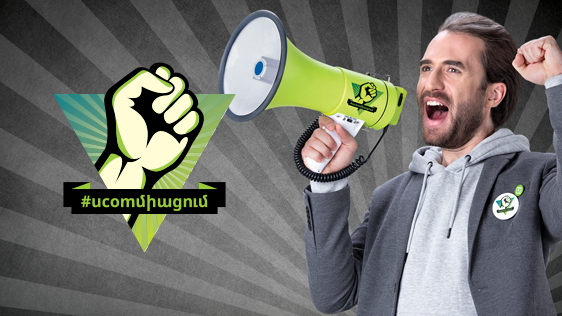 According to Hayk Yesayan, the Director General at Ucom, the company has launched the “ucomisation” (#ucomմիացում or #ucomconnection) campaign. The existing and new subscribers of fixed services, by joining the Universal mobile connection service, will get up to twice more minutes, up to twice more internet and will benefit from Universal service without paying the monthly fee for 4 months. Moreover, 4 close ones to the existing or new customers may also benefit from Universal service, by presenting a special voucher, allowing to use the service at these conditions. For example, within the framework of the offer, the subscribers of Universal 5500 tariff plan on a monthly basis will get 1500 minutes to call all local networks, Artsakh, USA, Canada and Russia, 10 GB of mobile internet and possibility to send 1500 short messages to all local networks and Artsakh, i.e. twice more than the standard volume of the inclusions. “By the way, all 5 subscribers included in the closed user group will be able to activate the MediaRoom application and watch 55 channels over mobile TV, without any fee. This is probably the best convergent offer in the market now,” said Hayk Yesayan, the Director General at Ucom. Let us add, that the offer is applicable to the current and new subscribers օf U!TV, U!Net, TriplePlay fixed services, who will commit for Universal service for 2 years.